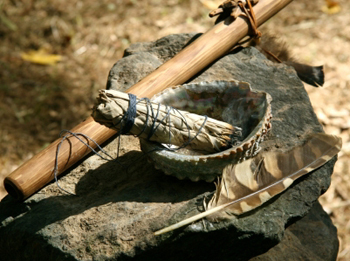 A smudge ceremony kit contains all the essential ingredients to perform a healing smudge ritual or ceremony. You can put together your own personalized kit or purchase one already assembled for you. Kits usually contain one or more wands or sticks, either of pure sage or sage and a selection of herbs that pleases you. There must be a fireproof vessel of some sort - abalone shell, bowl, plate, ceramic pot, small baking dish, censer, brazier, or other fireproof vessel in which to burn your loose or crushed herbs. Of course, matches or a good cigarette lighter are needed. Paper and pen are handy for jotting down thoughts and impressions. A feather or a fan are used to waft the sacred smoke in a desired direction.